The average American family spends between $700 and $1300 per month on groceries according to the U.S. Department of Agriculture. I say “average” as if that were an actual thing. 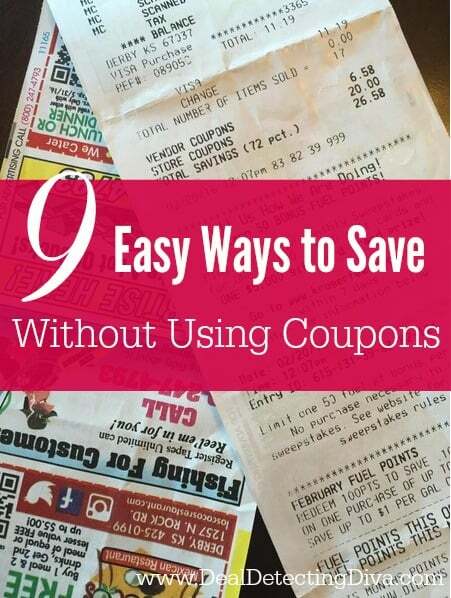 I use coupons for just about every item I purchase, we rarely eat out, we make our own laundry detergent and we generally save any way that we can. The bottom line: I hate spending money. Our family of four spends around $250 – $300 per month on everything that we buy. We use coupons for items when they go on sale, whether it is Heinz or Hunts makes no difference to me – except Viva paper towels. Love me some Viva. Just because you have a coupon doesn’t make it a better deal. 1. First and foremost, watch the sales. 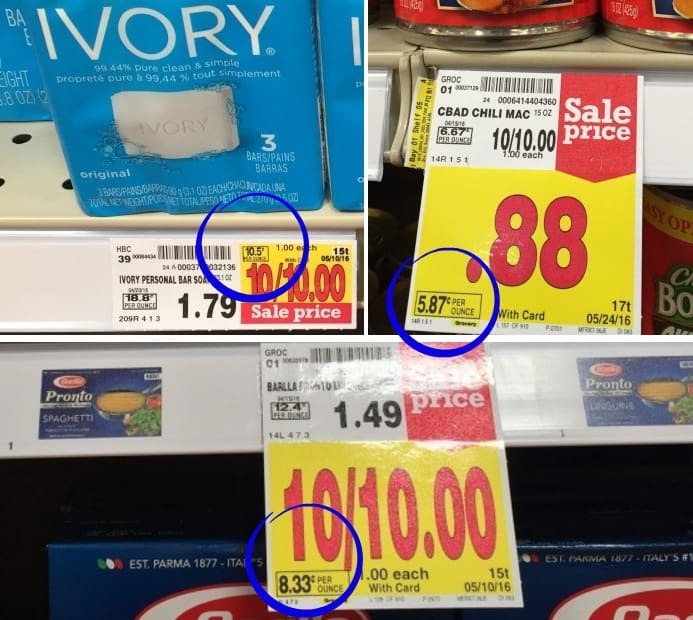 If you regularly shop at Dillons (a Kroger affiliate) watch their weekly sales. We do that for you on Deal Detecting Diva (as well as many other stores), so watch for our three star (***) deals on our weekly coupon matchups – those are the best deals. We’ll always tell you when to stock up and when not to stock up. Buying something you would use regardless when it is on sale – even when you don’t need the item or have coupons – saves considerably all on its own. 2. Pay attention to price per unit and price per ounce. On the shelf sticker, the store will break it down for you. Instead of looking at the PRICE of each item, you’re looking for the VALUE of each item. If the store brand of pasta was selling at just 7¢ per ounce and I needed pasta, I’d buy the store brand. If I had a coupon for Barilla Pronto that lowered the 8.33¢ price per ounce to 7¢ or less, I’d get the Barilla. 3. Buy in season. While this is particularly true for fruits and vegetables, it also extends to different international holidays including Cinco de Mayo and the Chinese New Year. You’ll find Mexican and Chinese foods on sale during those times of the year respectively. Capitalize on that! 4. Try new brands. When looking for the absolute best deal without a coupon, you’ll rarely get to be brand loyal. If you take the time to read the label on the foods you purchase, you’ll notice that many of the name brand products and their generic or store brand counterparts are actually manufactured in the same facility. If you are dead set on a certain brand, you’ll want to stock up when that items is on sale, to last until the next time the item goes on sale. Typically, sales cycles repeat themselves every 6-12 weeks. 5. Shop around. If you do the majority of your shopping at one store, consider branching out. It’s a good idea to keep a price list sheet of the “regular prices” for 10-15 items your family always purchases, at the stores you frequent. You’ll know that the regular price of bread at Walmart may be $1.48 whereas you can usually find it at Target for just $1.25 – for example. Print a copy of my personal Buy Price List – the list of prices I personally shoot for when stocking up on a particular item. 6. Stick to your list! As a couponer, I know exactly what I’m going to purchase when I walk into a store. I have my list and I follow it. No exceptions. When shopping, put up your blinders to impulse buys – you don’t NEED the item – just keep walking. Make a list and stick to it. Don’t shop hungry! 7. Buy meat when on sale. Paul and I purchase the majority of our meat from Zaycon Foods. When they offer promo codes (we’ll let you know when they do!) we can usually get the 100 % natural chicken with no added hormones, additives or artificial ingredients for just $1.69 per pound! Last time we stocked up on ground beef – 100% American cattle raised on an all-grass grass diet up to 700 lb and LFTB (pink slime) free – for just $2.67 per pound! Then we brown at least half of it to use for quick dinners later on. See how we do that right over here. 8. Check the clearance rack. Every day our local grocery store adds a slew of closeout items to the clearance section, some we’ll use and some we won’t. But we make sure to check it every single day! We’ve found the large containers of high-end Extra Virgin Olive Oil for just 79¢ – normally $12.00+! 9. Use your smartphone apps! The easiest way to save at the grocery store is by taking advantage of digital coupons and rebates. I use ibotta, MobiSave, SavingStar, Checkout51, Shopmium, Find & Save, Cartwheel, Shrink and Berry Cart on a regular basis. I have saved thousands of dollars accumulated between all of these apps. • High End Hair Care: Where to Buy, What to Buy, When to Buy AND the Curling Your Hair with a Flat Iron Trick! Do you have any other DIY recipes for dryer sheet, dish soap, dishwasher soap?